This is my journey towards the next level! Born Nov. 20, 1992, Alex is the daughter of Heidi and Christopher Milan. Alex was a member of the National Honor Society, the Spanish Honor Society, the National Science Honor Society and Mu Alpha Theta (Math Honor Society) in high school. 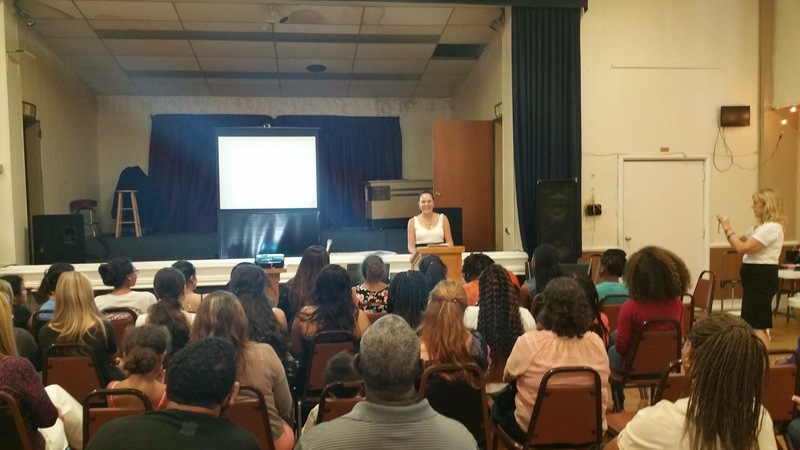 She graduated in 2011 as the valedictorian of her senior class with an unweighted grade point average of 4.0 and a 6.32 weighted grade point average. 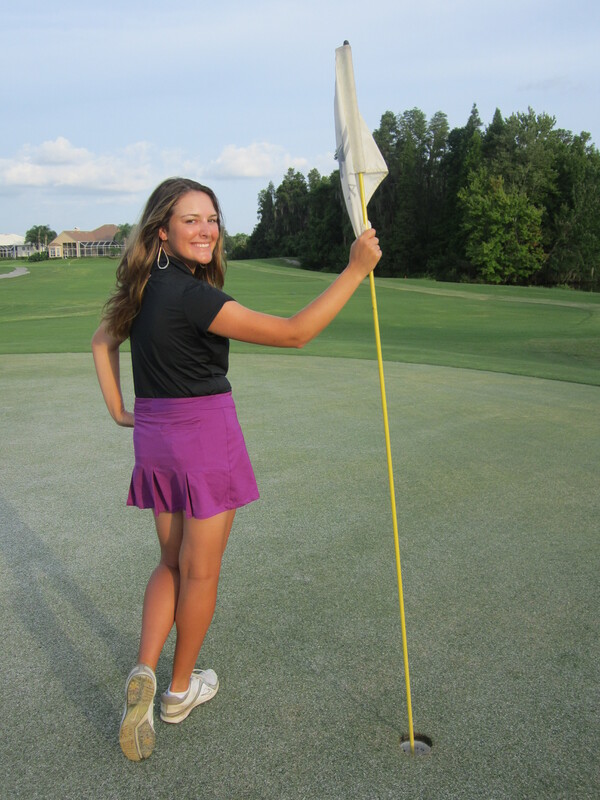 Alex was one of 12 female students in the nation to be named a Hewlett Packard/National Junior Golf Association Scholastic All-American in 2010. 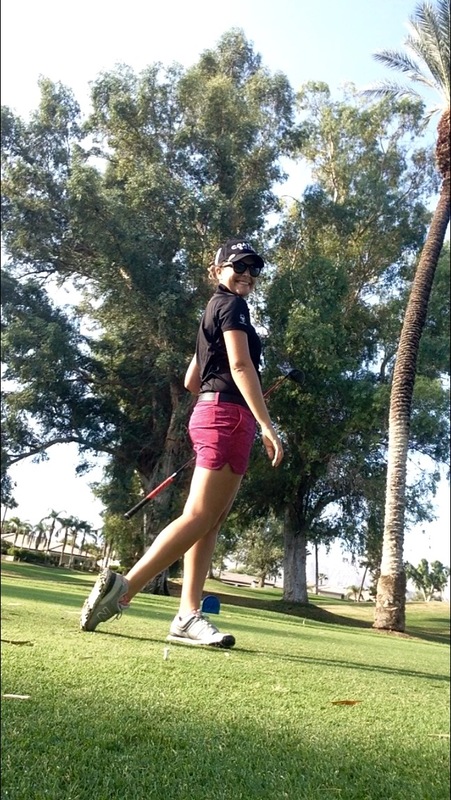 Before excelling as a golfer, she was highly competitive in swimming, figure skating, volleyball , softball, tennis and studied four types of dance. 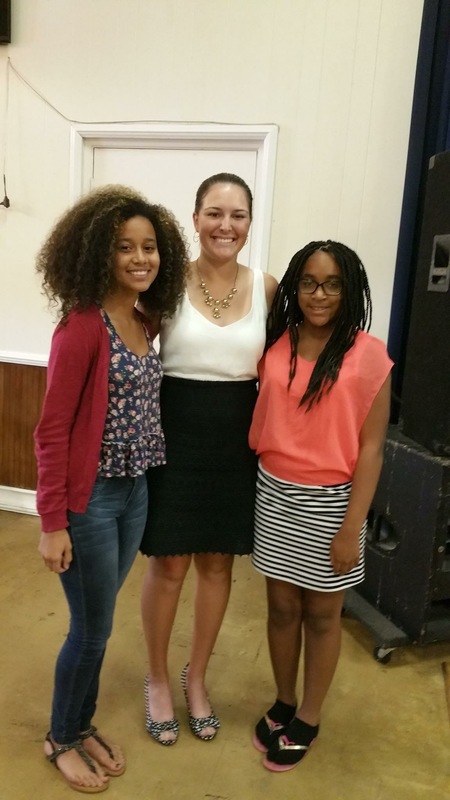 She also led her AAU under 14 volleyball team to a third place finish in the state championships. 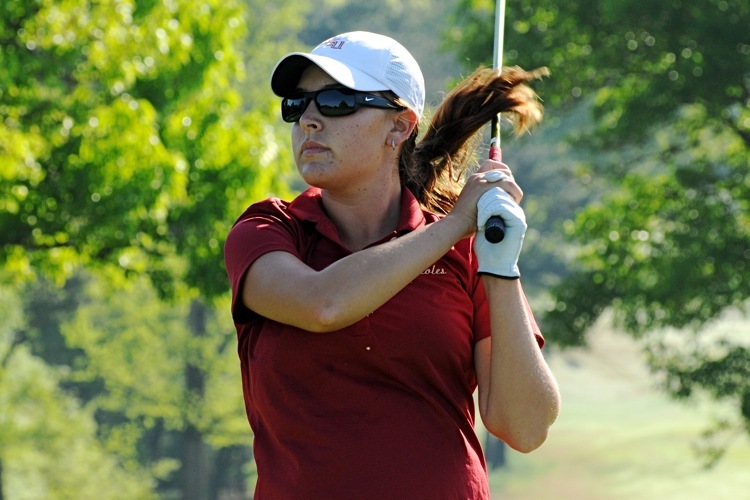 Alex was ranked 38th nationally among high school golf seniors in 2011. 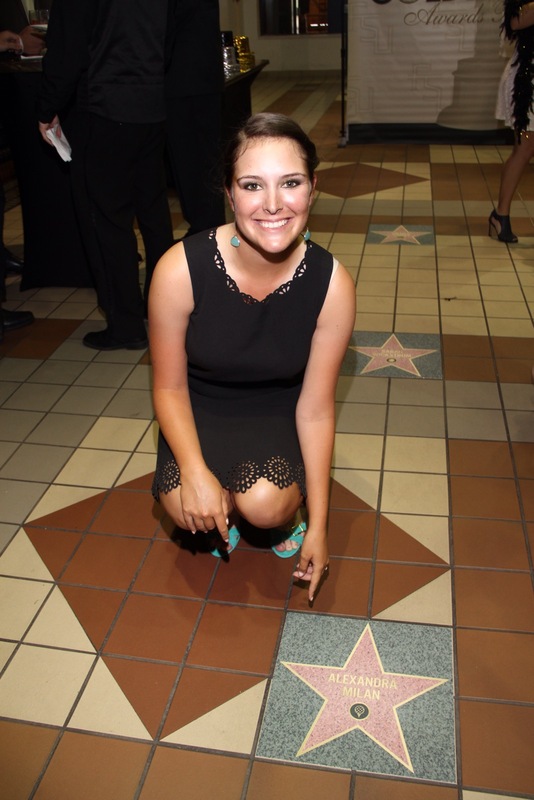 She was also named the Casey Most Valuable Golfer of the Year as a senior as awarded by the Hillsborough County School Board and a two time area Player of the Year by the St. Petersburg Times and the Tampa Tribune. 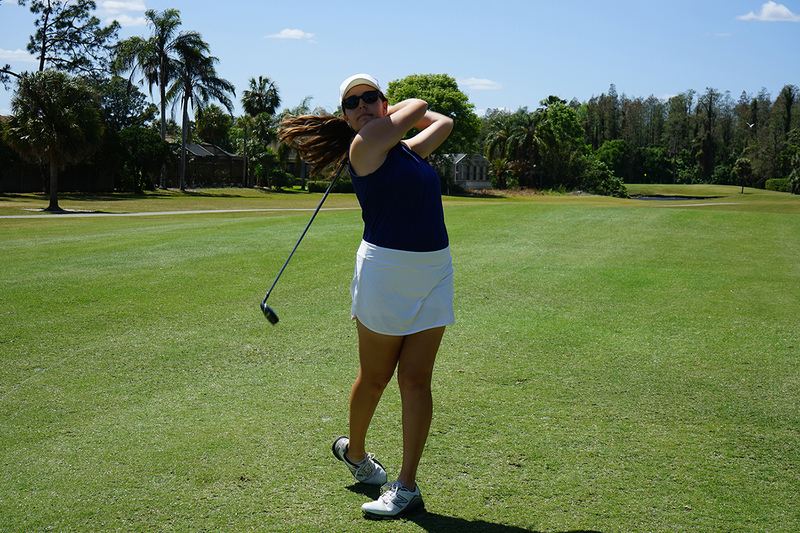 Alex earned All Hillsborough County First Team honors four times by the St. Petersburg Times and the Tampa Tribune. 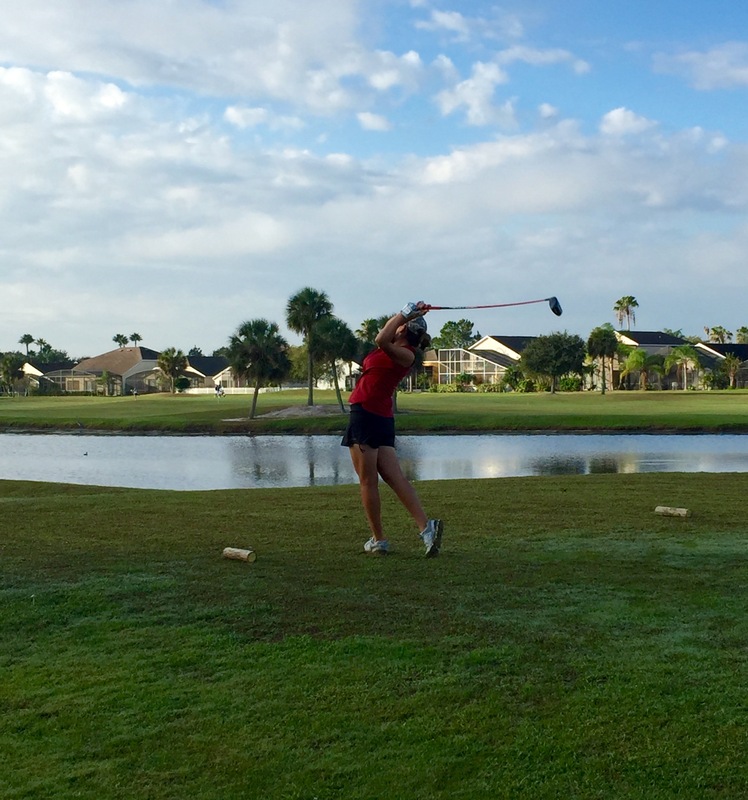 She was a four time district champion in each of her high school years – as a freshman and sophomore at Sickles and as a junior and senior on the Steinbrenner varsity. 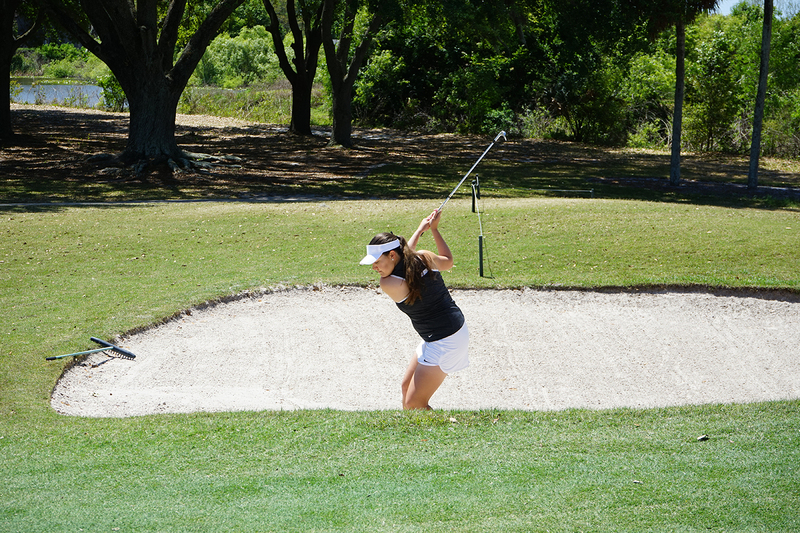 She was the regional champion as a sophomore in 2009 while at Sickles High School with a score of 64 and earned Western Conference First Team honors in each of her four prep seasons. 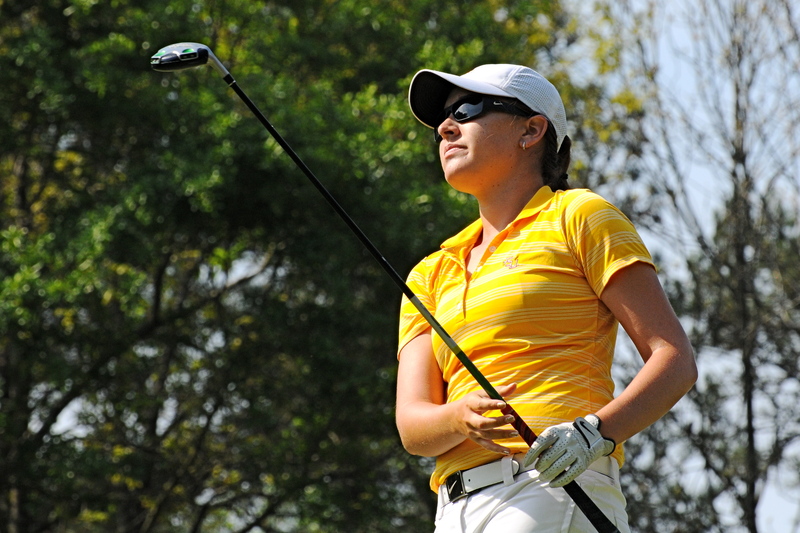 Alex led the Warriors to the first state championship appearance in school history with a runner up finish in the regional championships in 2010. 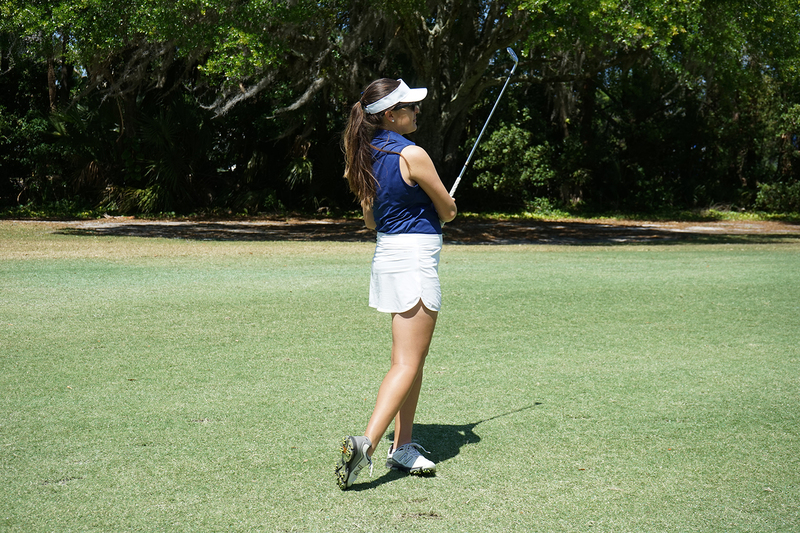 Alex earned eight top 10 finishes in 13 AJGA events and was a three-time member of the Junior Florida Cup team and holds the record for nine holes (31) and season scoring average (35). 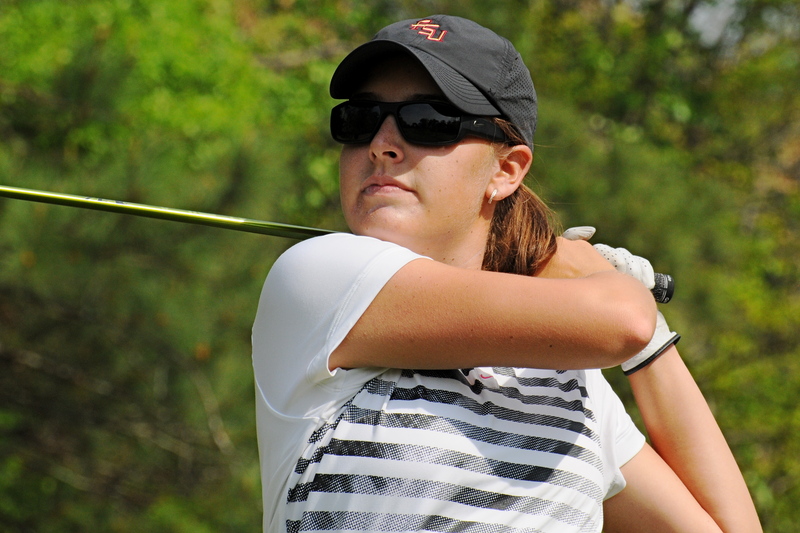 Alex earned All-ACC honors in 2014 as one of the top golfers in one of the top conferences for women’s collegiate golf in the nation. 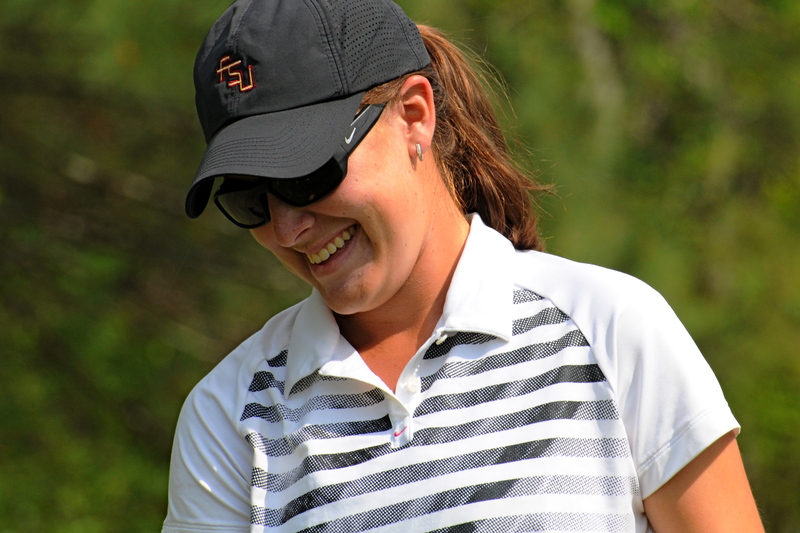 She is one of top golfers in the ACC for her senior season of 2015 and earned her first career collegiate individual championship as she claimed medalist honors at the Spring 2014 Florida Challenge. 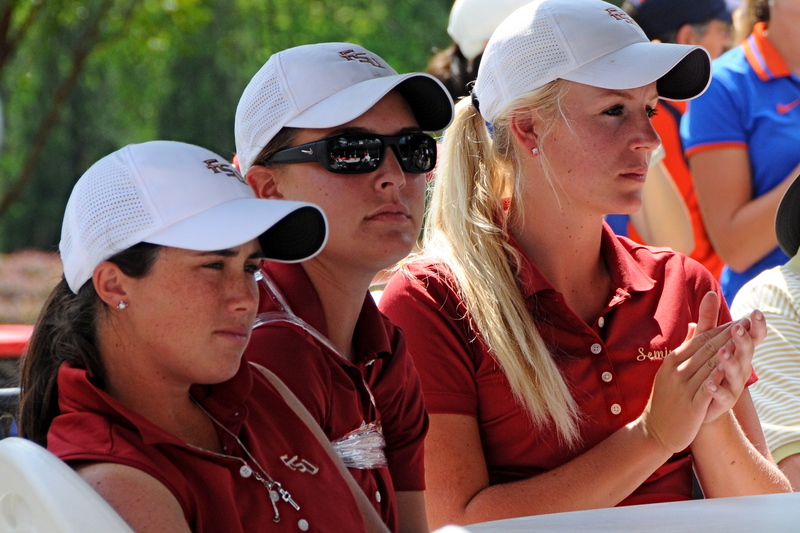 Alex has played in two NCAA Regional Championships (West in 2013 and East at SouthWood Golf Club in Tallahassee in 2014) and in three ACC Championships in the first three years of her career and has helped the Seminoles to three consecutive NCAA regional appearances to bring their streak to a school record nine consecutive appearances. 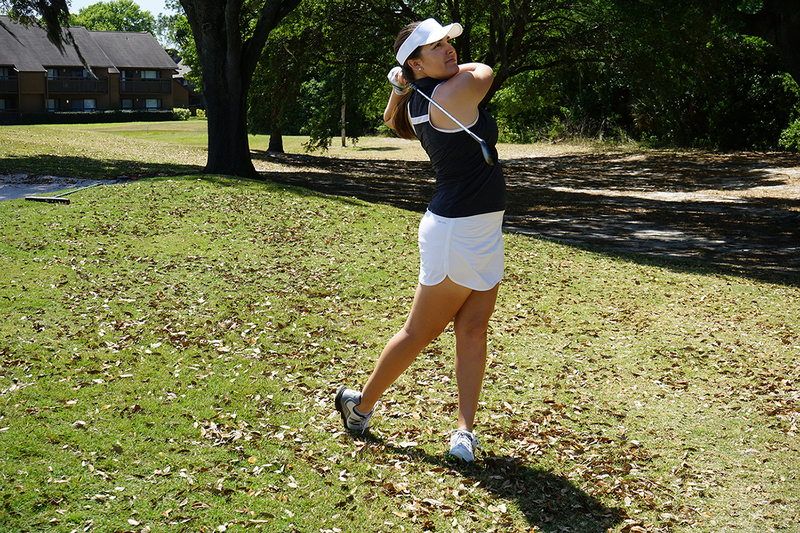 She is one of the most improved golfers in all of college golf as she has cut more than three strokes off of her average during her career as compared to her freshman season. 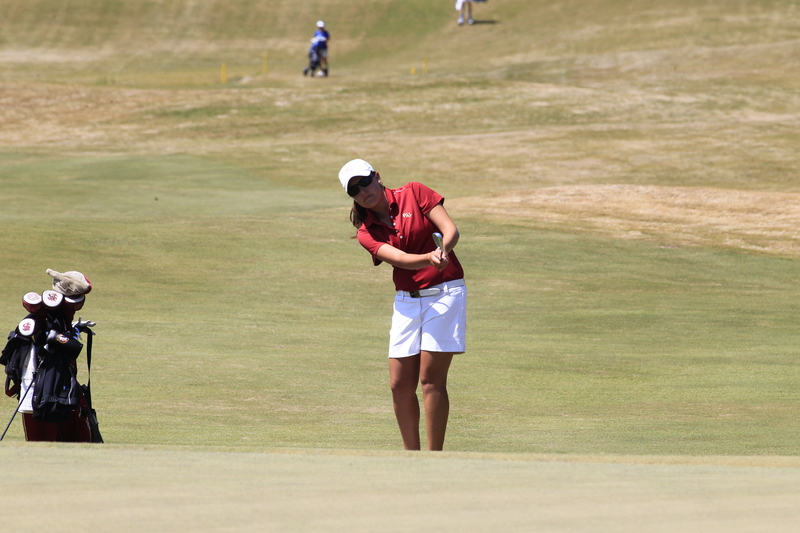 Alex earned her career best statistics for a single round (68 in the third round), 36-holes (71-69=140), for a three round tournament (208) and for a tournament score vs. par (-8) in helping lead the Seminoles to the team championship at the Web.com/Marsh Landing Intercollegiate during the spring of 2014. 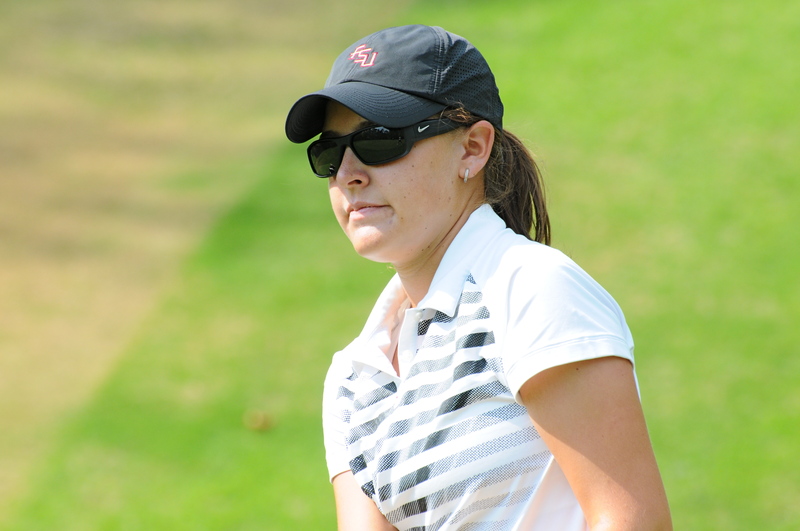 Alex tied her career best for a single round with a 68 in the first round of the fall 2014 Mo Morial Invitational and accumulated three top-15 finishes during the fall of her senior season brought her career total to eight with top-15 placings coming at the Florida Challenge (first), the Web.com/Marsh Landing Intercollegiate (tied for second) and the Bryan National Collegiate (tied for 12th) during the spring of 2014, back-to-back top-15 finishes in the Spring of 2013 at the Florida Challenge (tied for third) and the Florida State Match-Up (tied for 14th) at SouthWood Tallahassee and three top-15 finishes during the fall of 2014 (tied for fifth at the Mo Morial Invitational, tied for 13th at the Lady Paladin Invitational and tied for 15th at the Alamo Invitational. 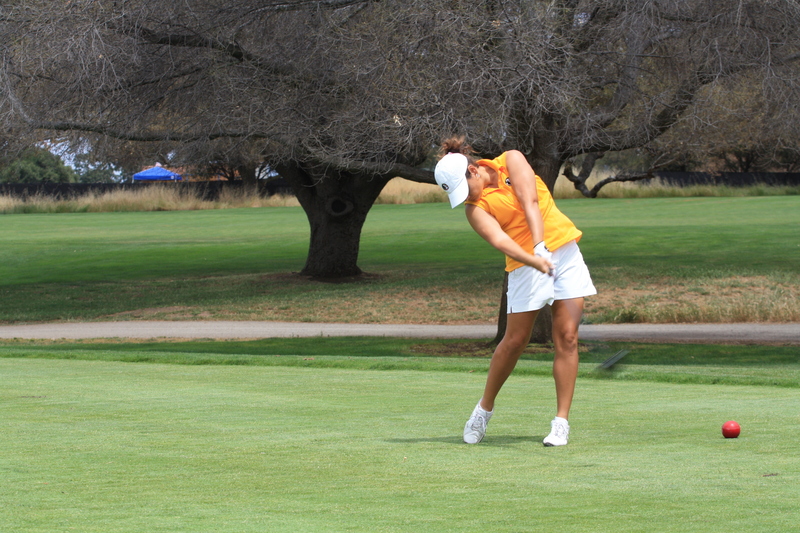 Alex earned seven top-25 individual finishes in her 11 events as a junior including five consecutive during the Spring of 2014. 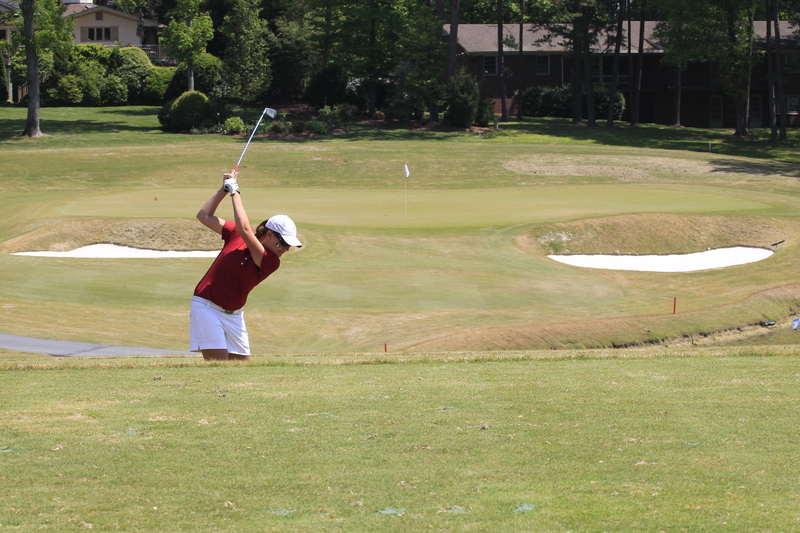 Alex advanced to the match play portion of the 2014 Women’s Amateur Public Links Championship at the Home Course in DuPont, Wash. and played in the 2014 British Ladies Amateur Championship and the 2014 Trans National Amateur Championship. 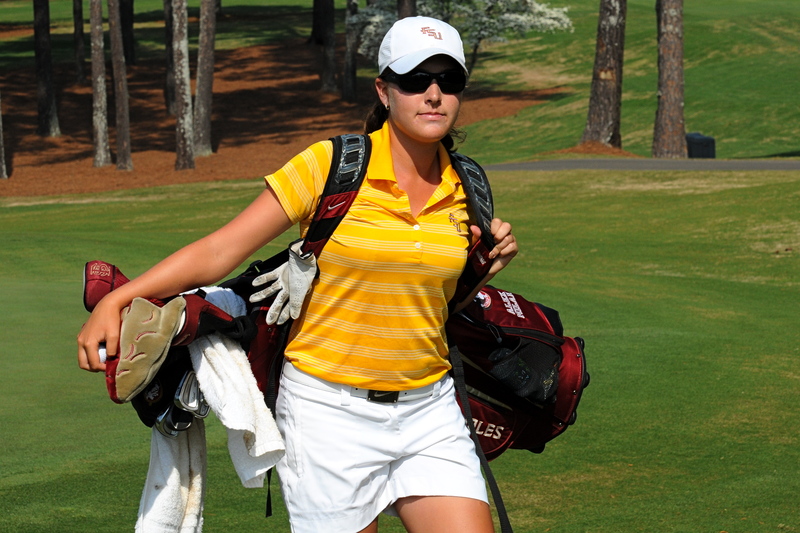 Alex was named to the 2012, 2013 and 2014 ACC Academic Honor Roll and named to the 2014 All-ACC Academic Women’s Golf team. 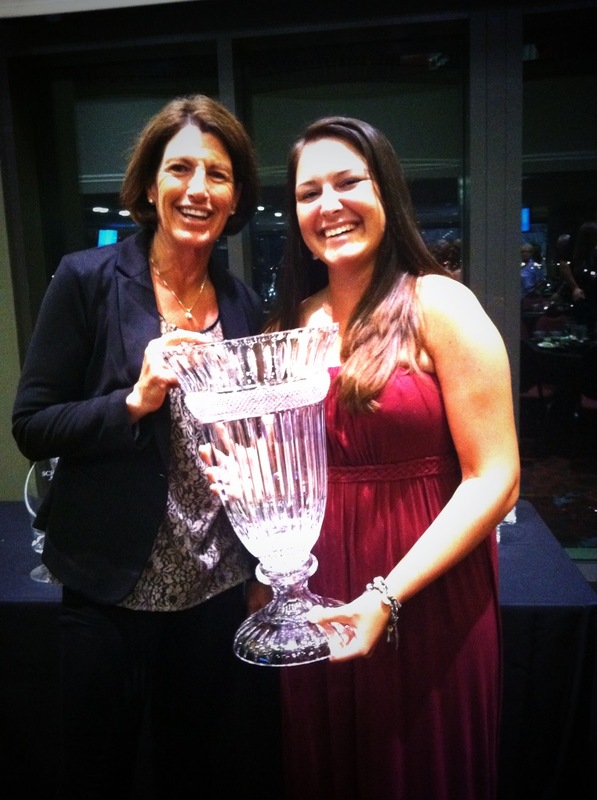 Alex the Golden Torch Award winner for women’s golf in 2014; the Golden Torch is presented annually to the top student-athlete on each of Florida State’s athletic teams. 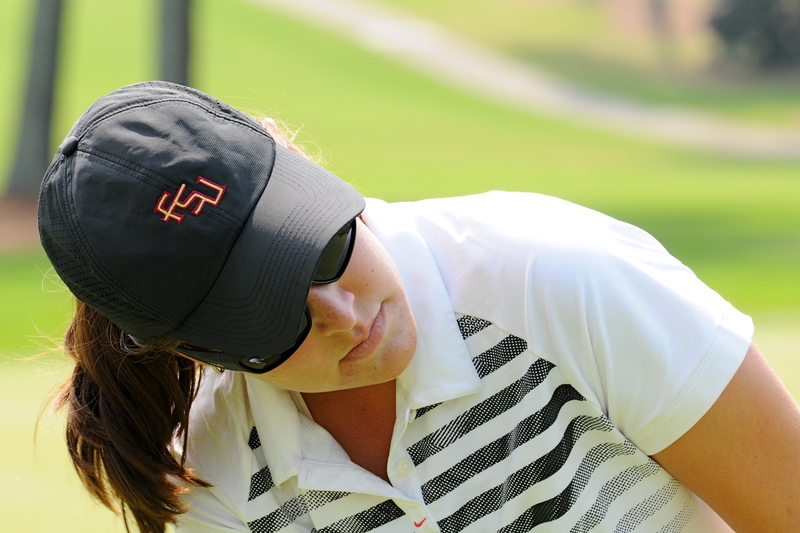 Alex averages 75.74 strokes in 72 rounds during 29 tournaments entering her final season as a Seminole – the spring of 2015. To contribute directly please use PayPal. This has the lowest fee structure and allows me to receive every penny! For available logo space pricing, corporate events, and appearance fees, please connect with one of my social media links or reach out via a comment or email. Subscribe for updates from Alex! 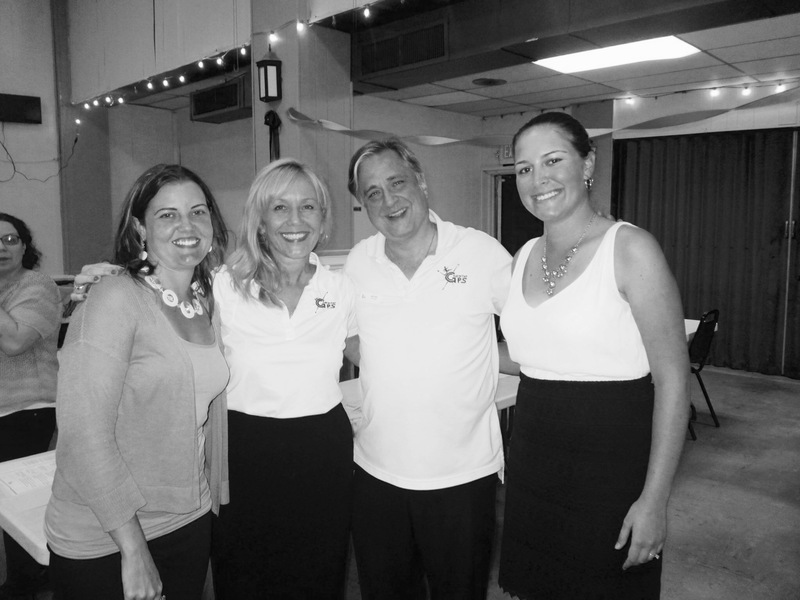 Last fall, Julie Inkster spoke at the Schooner Classic in Norman, Oklahoma. While this was an over-the-top, amazing event for a myriad of reasons, hearing a role model of mine speak, then talking with her and getting a quick picture, was icing on the cake. What a powerful statement that truly is when you take a moment to consider it. 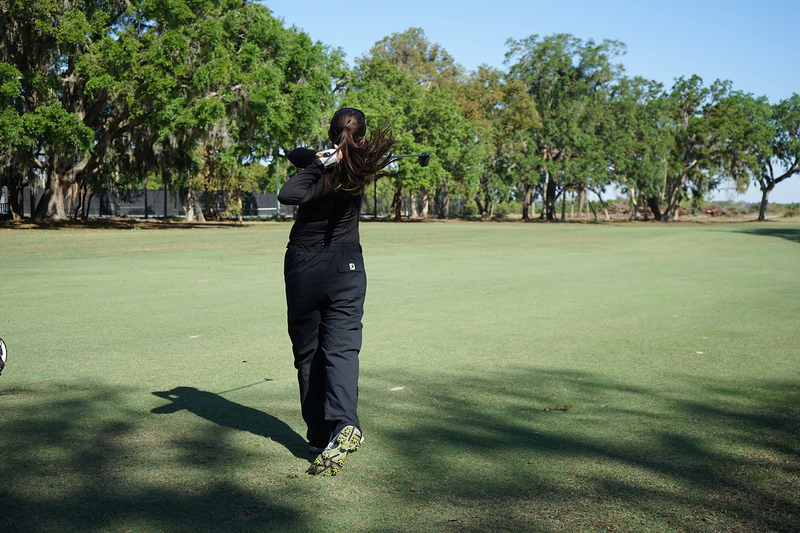 “Golf is what I do; Golf is not who I am.” Sometimes it is hard to remember that golf is not a part of and should not be a part of your personal definition of self. I cannot count the number of times I have been introduced to my parents’ friends and co-workers and the first thing they respond with is, “Oh, you’re the one who plays golf?” Or how many times a professor or peer on campus only remembers me as “the golfer.” Now while I spend a copious amount of my time playing golf, it can be easy to start to define myself with it. What an unhappy mistake that can be. 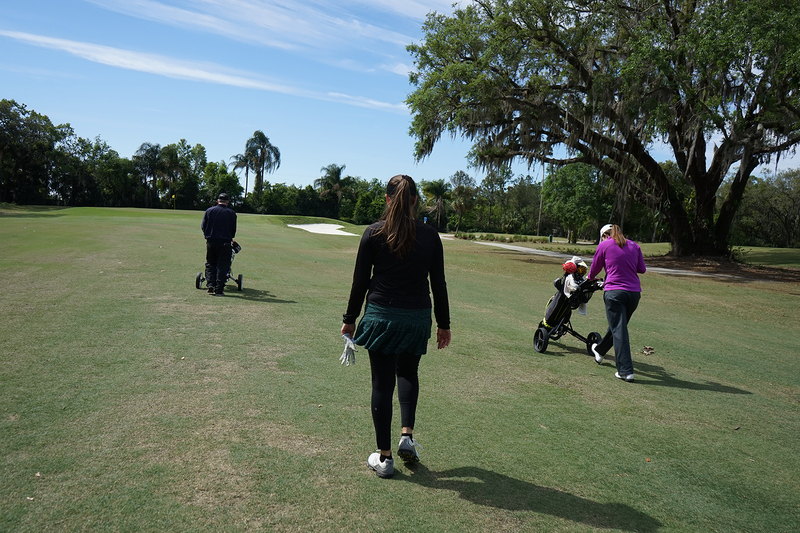 Last spring I found myself walking off the course after multiple bad rounds of qualifying, miserable and lost. I felt like my life was sideways and I was so unhappy with everything in my life, because of how I was playing. 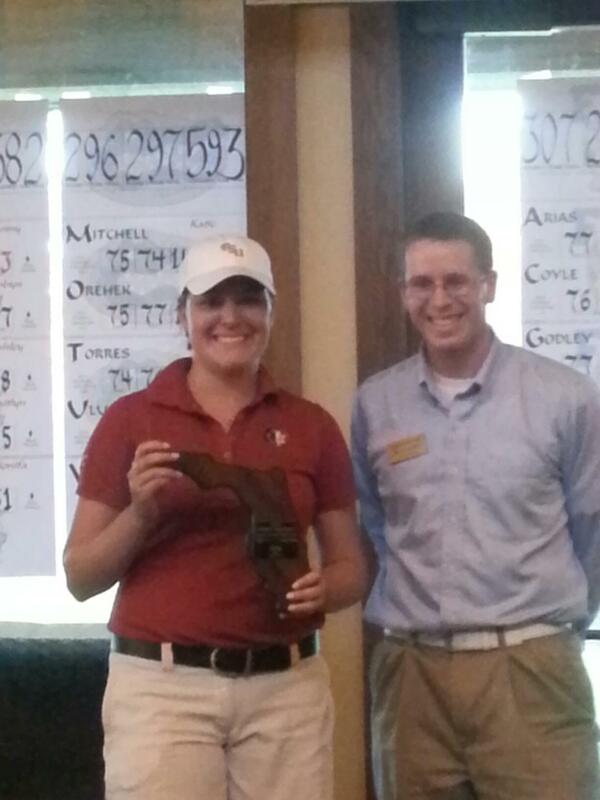 With the help of my amazing family, boyfriend and swing coach, I was able to realize my mistakes. One night after crying because I had played badly, my boyfriend, Tyler, looked at me and asked me a tide-changing question, “If golf makes you so upset, then why don’t quit, Alex? I know deep-down you love it, but you aren’t acting like it. 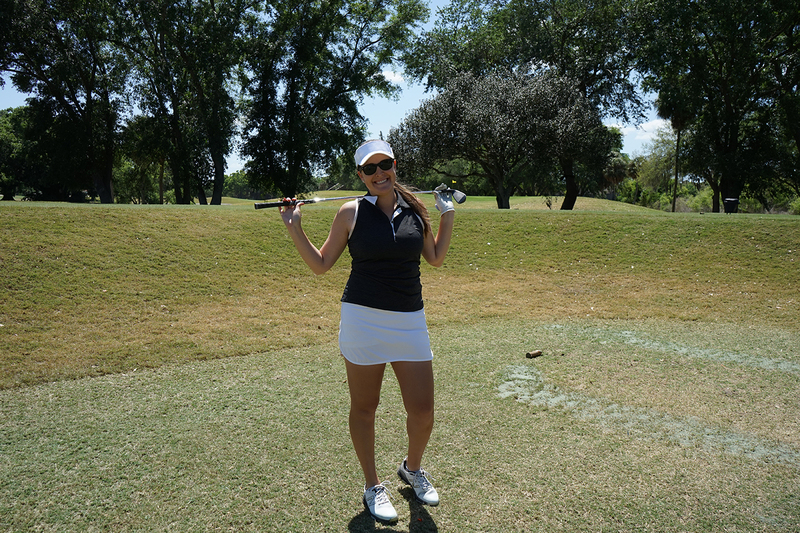 Stop letting a few bad days take away something you love.” What a revelation from my non-golf playing boyfriend. I was holding on to the results of my rounds like they defined me and I was using that lens to view the rest of my life through. 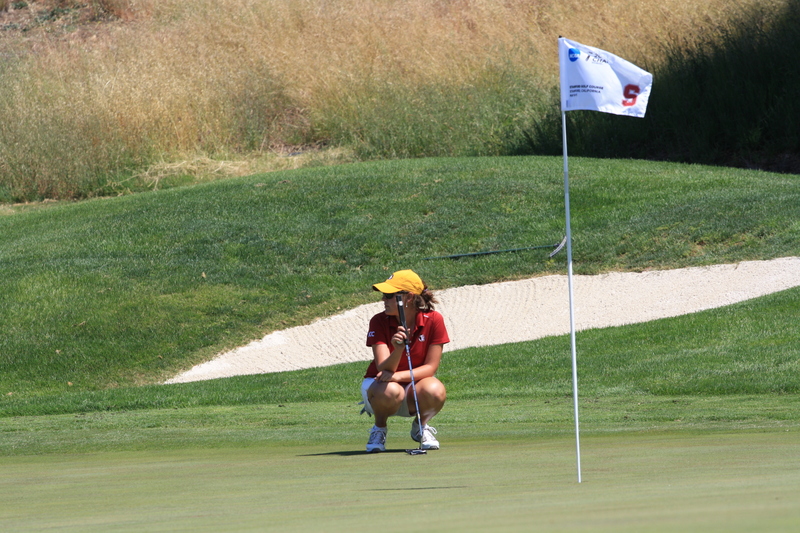 All these moments made me own and live an important truth; I am more than just a golfer. I have a wonderful family, a boyfriend who loves me- no matter what score I shoot, the best teammates and great friends. 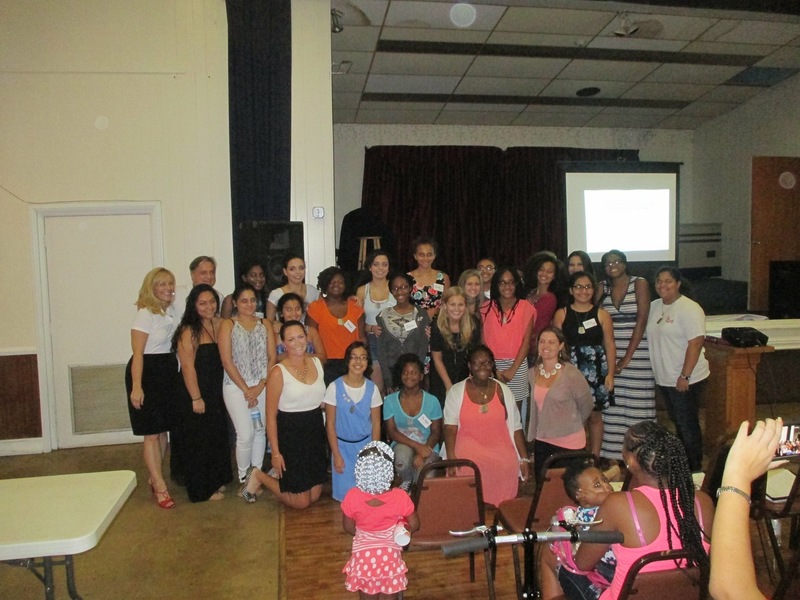 I love to spend time with all of them, I love to give back to my community and I love to learn. 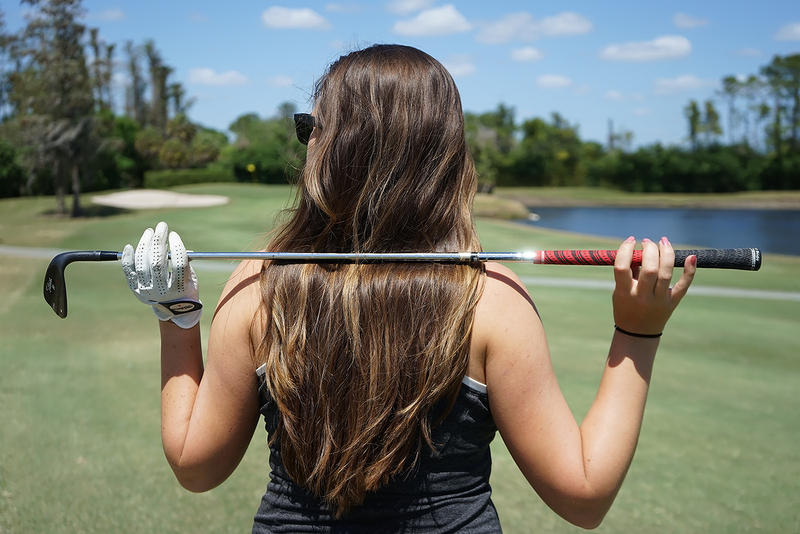 I play golf because I love it. Practice is where I find my quiet peace and where I do all my best thinking. 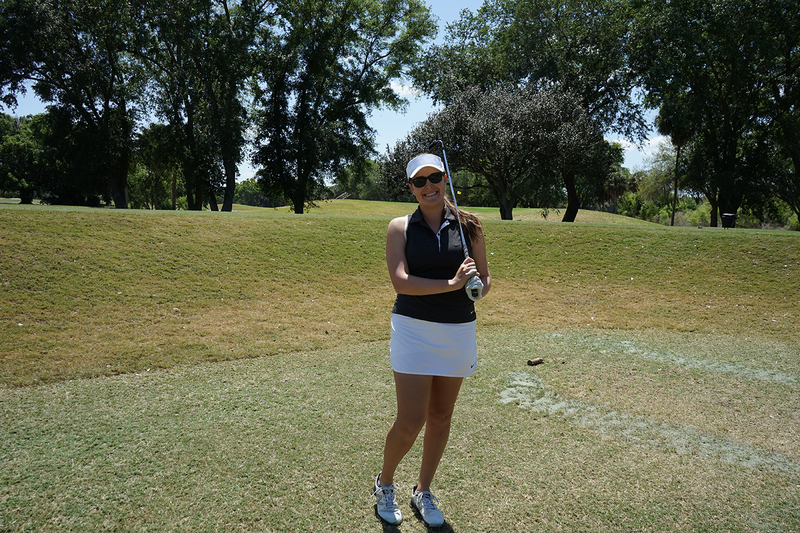 Everything makes more sense when I can relax, think and hit some golf balls on the range. 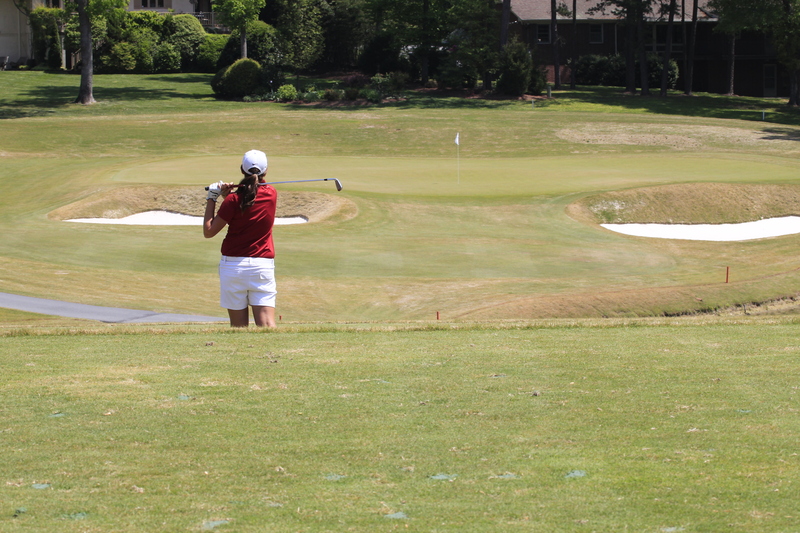 I play golf because it is fun and I hope that I never lose sight of that again. 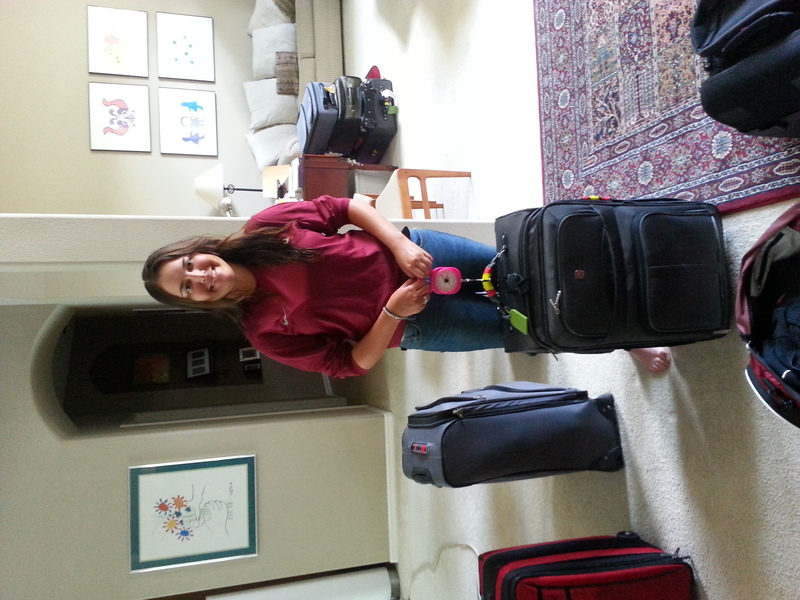 I am so excited to leave today to start my adventure across the pond! All throughout the next few weeks, I will be checking in and updating you on my travels. 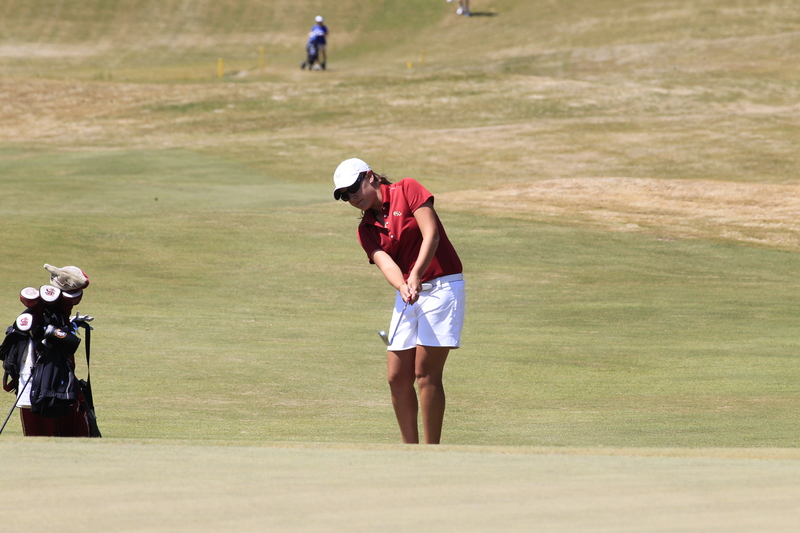 When I found out I gained entrance into the field for The Ladies British Amateur, I was ecstatic. This will be my first opportunity to play in Europe- and the first time I have ever traveled there. I am lucky enough to have my whole family make the trip with me, my parents, sisters and grandparents. This trip will be an early college graduation present for me! 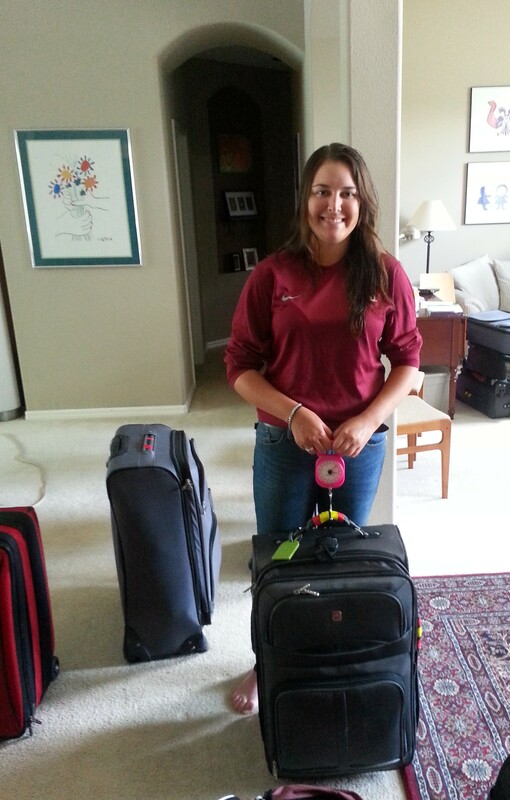 The biggest struggle in preparation for traveling was figuring out what to pack! I kept jokingly telling my mom that I needed to call Coach Bond and ask her to type me up a packing list! 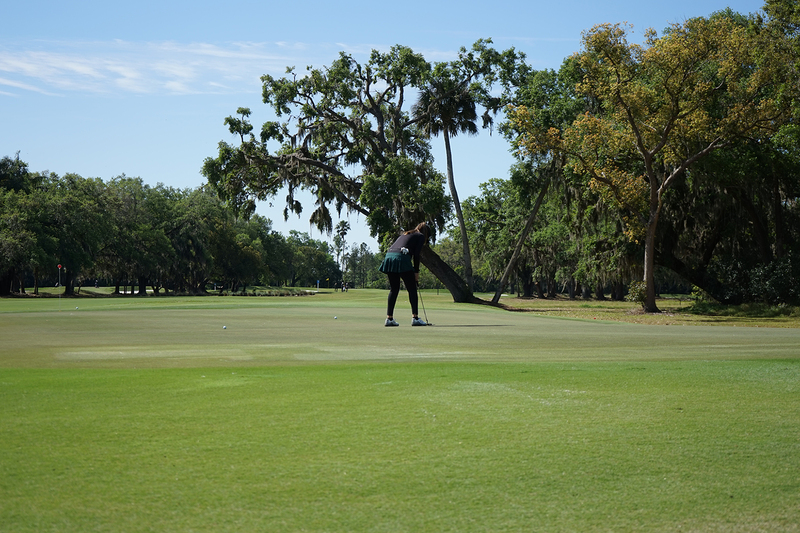 Normally for every tournament, we received a detailed itinerary, complete with tee times, dinner events, outfits to be worn on the course, dress codes for various dinners, and a reminder of any extras we might need for the weather. I was sorely missing my list as I tried to plan for foreign weather. The next obstacle was trying to fit everything I thought I might need into one 50 lbs bag, I managed- but just barely! And now that I am sitting at the airport, I am hoping that I have remembered all the important things. Our first stop will be a few days in London, and then we will head down to Sandwich, where I will get my first view of the championship venue, Royal St. Georges’! 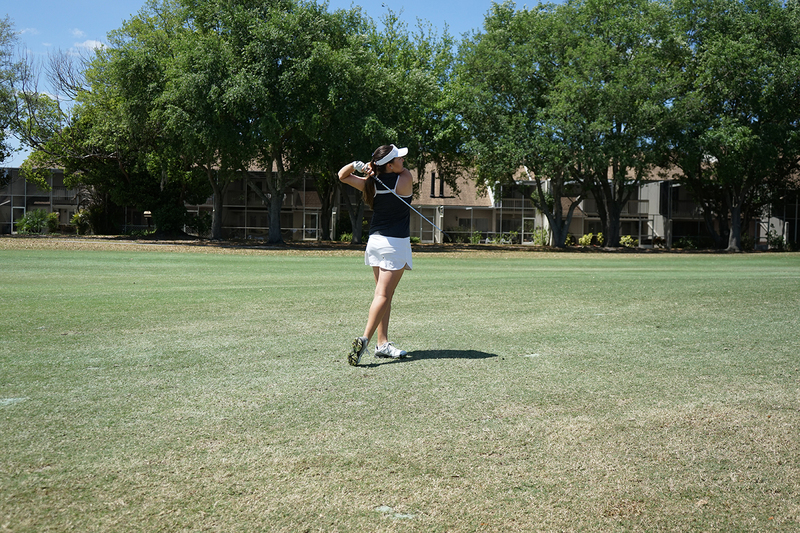 I cant wait to get to the course and start preparing for the tournament. I will be checking in soon! I found a phone booth on our walk! Yesterday I arrived in London after a 9 hour flight and an hour to get through customs. We then had a two hour car ride to the apartment we are renting for a few days in London. I have to say, the flight over was not the most comfortable. I have a new appreciation for all the long plane rides that my international teammates are subjected to! I barely got any sleep on our red eye, but we arrived at our apartment at 11:30 London time. We are staying in a great location and decided to walk to the Camden Market and find some lunch, explore and get some groceries. 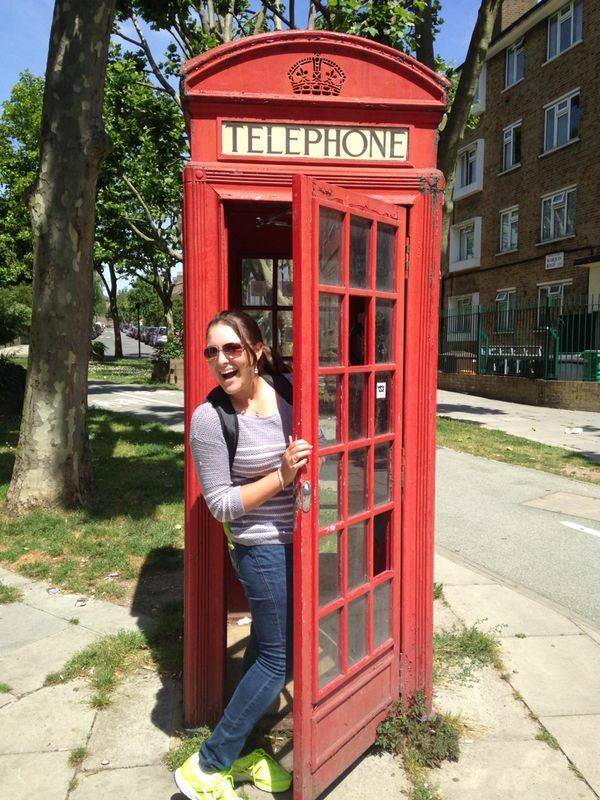 Walking through the streets of London was fun, there is plenty of public transit and so many town homes and apartments, it does not seem similar to any of our big cities in the states- everything is so much older! The Camden Market was fun, but there were signs everywhere warning of pickpockets! There were so many shops and booths and pubs to explore. We sat and relaxed for a bit next to the Camden Lock and watched a few boats get put through. We were trying to push through all the jet-lag but we were getting very tired. On the way back to the apartment, we stopped at a grocery store and filled our backpacks for the rest of the walk. After a quick dinner, we all dropped like flies! Some went to bed at 6pm, I kept myself up until 8 and then had a great night sleep. Today, I am off to explore some of the sights here in London, and Friday morning I will drive down to the golf course. 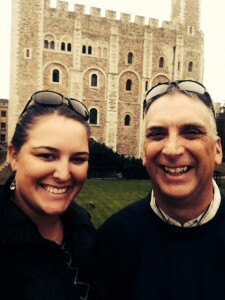 Dad and I on the outer wall with the White Tower behind us. I have spent the last two days exploring in London, and it feels like I have packed every adventure possible into them. I have explored the nooks and crannies of Westminster Abbey, retraced the steps of Jack the Ripper in the East End late at night, been deep in a bunker in Winston Churchill’s War Rooms, floated down the Thames on a river cruise, felt tiny standing below Big Ben, practiced my wizardry at Platform 9 and 3/4s and so much more! Two days ago, we went to Westminster Abbey and I am incapable of doing this magnificent building justice. When I stood before the main alter and heard the stories of all the weddings, coronations, and funerals I was covered in goose bumps. It was incredible to stand and see inscriptions written in the 11th century. 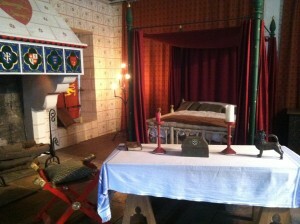 The history of the Abbey is unique and all the additions each have their own characteristics and details. Outside in the gardens, the inner courtyard was a quiet, peaceful place that people have enjoyed, like I did, for centuries. I was wandering through the stuff of history books. Yesterday we had the opportunity to spend the majority of an afternoon meandering around the Tower of London. As a few of you will know, I have a love of British history and historical novels so that afternoon was magical. We began with a guided tour full of history and stories. I got to walk the same grounds as figures like Anne Boleyn and Henry Tudor. We sat in the chapel and saw the tower green. Next we saw the crown jewels, and the instruments of battle through the ages. We explored every possible tower and even a medieval palace that was contained in the inner wall above Traitor’s Gate. The amount of history that surrounded me was stunning. After a day on the Thames, exploring the Jewel Tower, the Tower of London and The Tower Bridge, I ate at my first real French Restaurant. I am sure Laure would have been proud of me for all the adventurous food I tried! I sampled some bread and cheeses that I couldn’t pronounce, tried a bite of asparagus soup, ordered duck breast for dinner and had a mint infused tea for dessert. I felt like the meal went on forever, but it was fun to try some new things. Today we head out to Dover, where I will finally be able to see the course. I am very ready to get out onto the greens and begin to get some preparation in. While exploring London has been fun, I am looking forward to arriving in Dover. Hopefully the weather will stay mild! So far we have not had any rain and it will be in the low 60s on the coast. For now, I am saying farewell to London for the present. Finally got out to the course today! Yesterday, the course was only opened for members, so I just practiced at a course down the road. 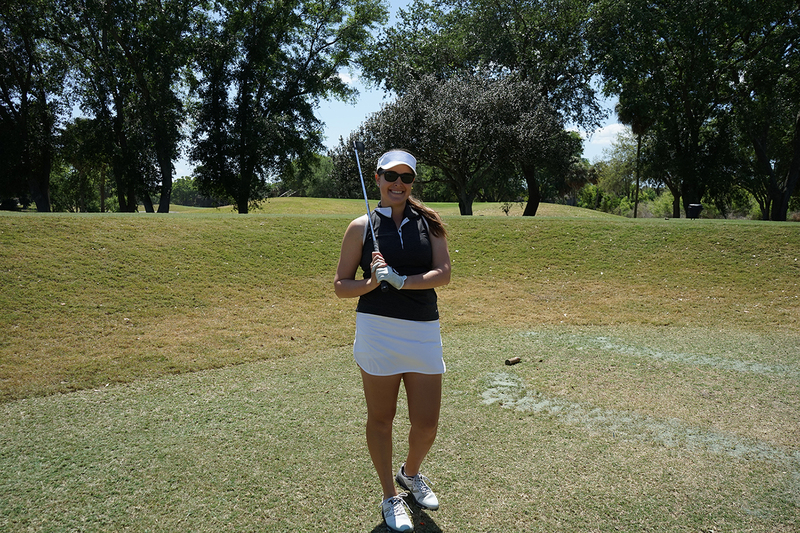 I hit on the range, hit some practice shots out of the fescue and practiced my bump and runs. My first round at Royal St. Georges was daunting. All I could see before me was hill after hill. No sign of a golf course at all. Standing on the first tee, there was no hint of a fairway to be seen. The first few holes were overwhelming, just trying to determine where to hit to. I was still hitting the ball well and managing to score decently but it felt like everything was moving too quickly. 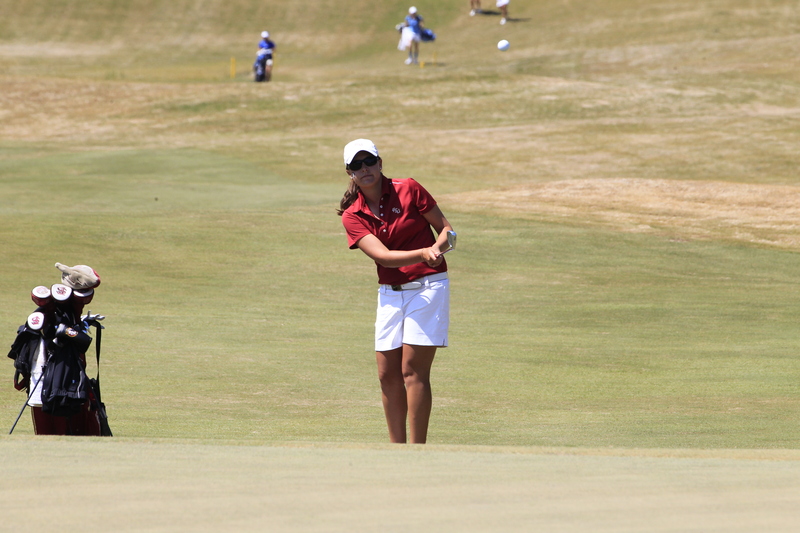 I was trying to take everything in, the ocean, the grass, being at the British Amateur. The course was a little intimidating today. I played in the afternoon, so the wind was really blowing. I lost more golf balls then I would like to admit, and hit all kinds of shots from everywhere. By the back nine, I had really figured it out though and managed a few birdies on the par 5s. It felt like I played 36 holes today. 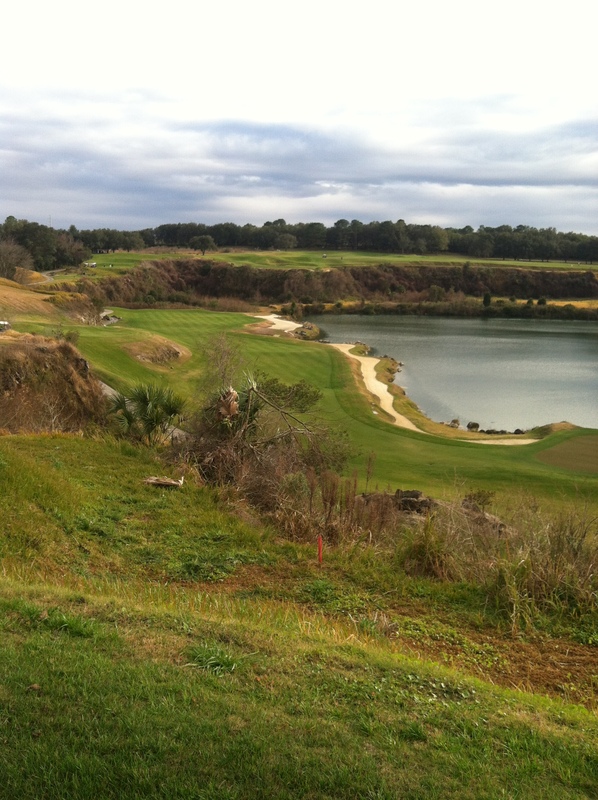 The course is a par 74, with 6 par 5s! Thankfully, I have another practice round tomorrow! Today’s practice went much better! I had an 8am tee time, and the wind blew a different direction today. 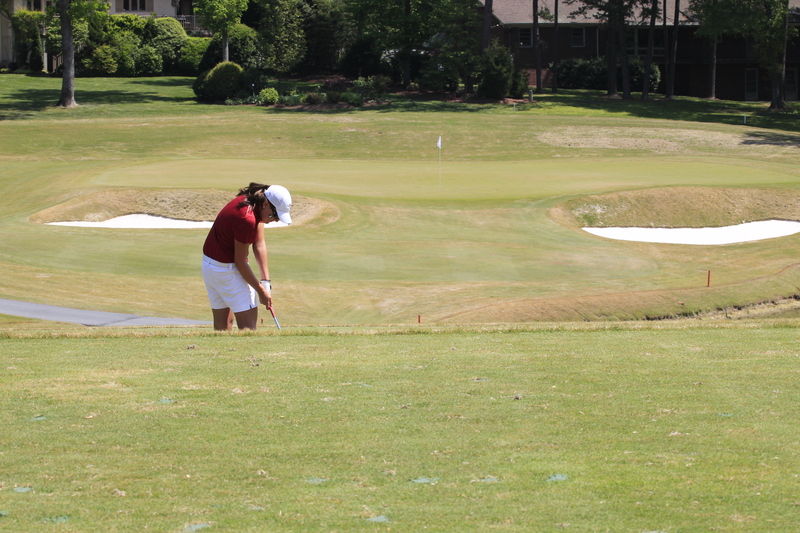 I played with two very nice girls from Germany and I found that the field looked much more like a golf course today! I hit bump and runs from 40 yards out in the fairway, navigated far away from the myriad of pot bunkers and avoided most of the tall stuff. I was able to read the greens better today too. The greens are so much slower here than at home, and they barely break at all in most places. I hit the putts firm and straight today and they went in. I made 6 or 7 birdies today and that gives me great confidence for tomorrow. I really felt so comfortable on the links today. Yesterday I was a bit nervous about the tournament, but after today I feel much better. I saw the birdies and I understand how to negotiate the course now. All that’s left is to play! After my early round, we went to Dover Castle! It was stunning and a clear day, so we could see the French coastline. the castle was beautiful, but I didn’t stay long. I have to get my sleep for tomorrow! I’ll check in tomorrow, wish me luck! Wow, what a day! I had a mid-day tee time today and made the best of the wind. 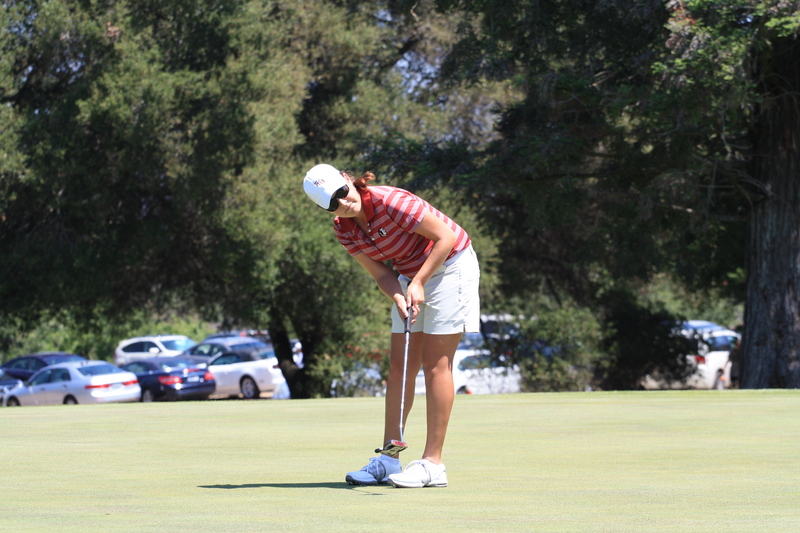 I started off the day with a birdie on the first hole and played my first 8 holes at 3-under par. I managed to hit my bump and runs and scramble when I needed to. I really took advantage of my length on the par 5s and just had to make an up and down for one of the birdies. Another hole, I hit 3 wood and then a wedge for another birdie. I even snuck a 3 iron hybrid in to 6 feet for yet another birdie! On number 9, I just missed an up and down and took a bogey. I made the turn at two under. The back 9 proved more of a challenge for me. On 10 I ended up running off the edge of the green and made a 10 foot putt for par. 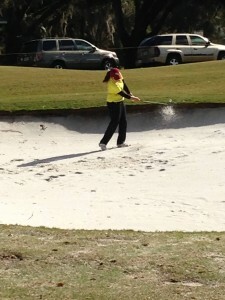 Then, on 13 I hit my drive in a nasty pot bunker. I had to come out sideways! Then I hit an 8 iron to 5 feet, and made par! But nothing was coming easy. I three putted 14 for a bogey, and bogeyed again on 15 after yet another pot bunker off the tee. On 16 the par three, another pot bunker and another bogey. I was frustrated. On the 17th, I ended up deep in the native grass after a tee shot took a nasty bounce. 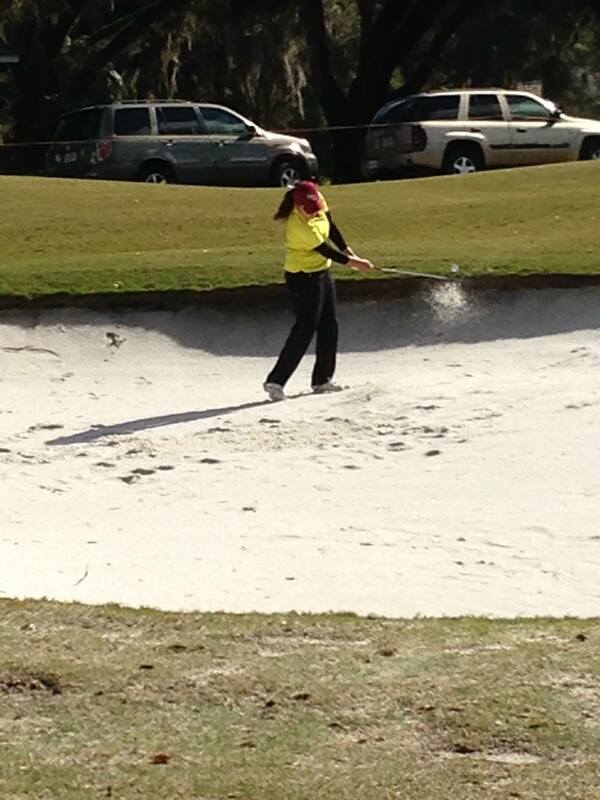 I hit a running 6 iron out to pin high… but in another deep bunker. 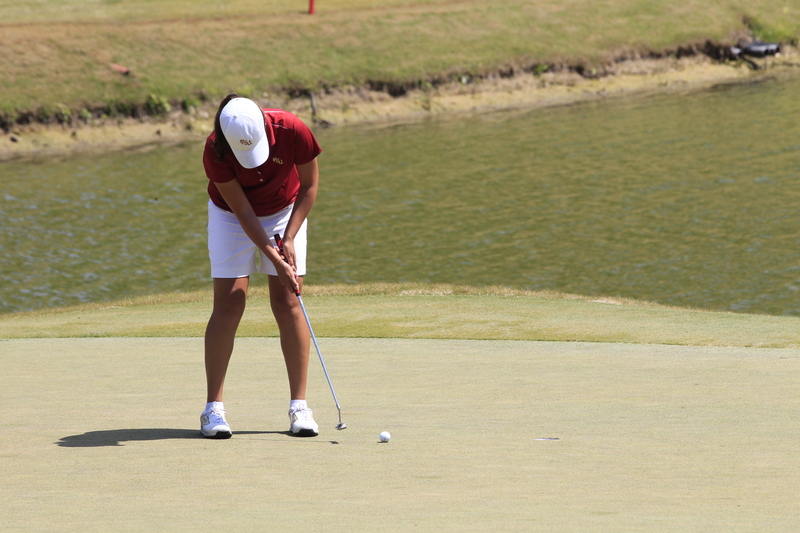 This time I got it out to 6 feet and made the putt! A par at last. The last par 5 played down wind and I got to pin high easily in two. A nice bump and run up the hill and a putt to finish with a birdie. I ended up at an even par 74, and I am in 16th out of 144. Wish me luck tomorrow! What an adventure I have had the last two and a half weeks! While I was playing at The SALLY, where I shot 74-74-74-74 to finish alone in 5th place, I received the most exciting news! 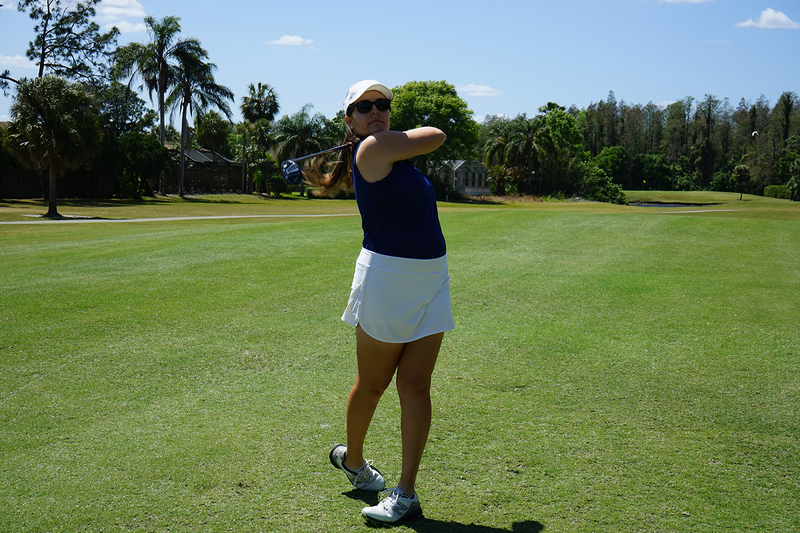 I had been awarded the amateur invite into the LPGA qualifier for the first event of the season…. 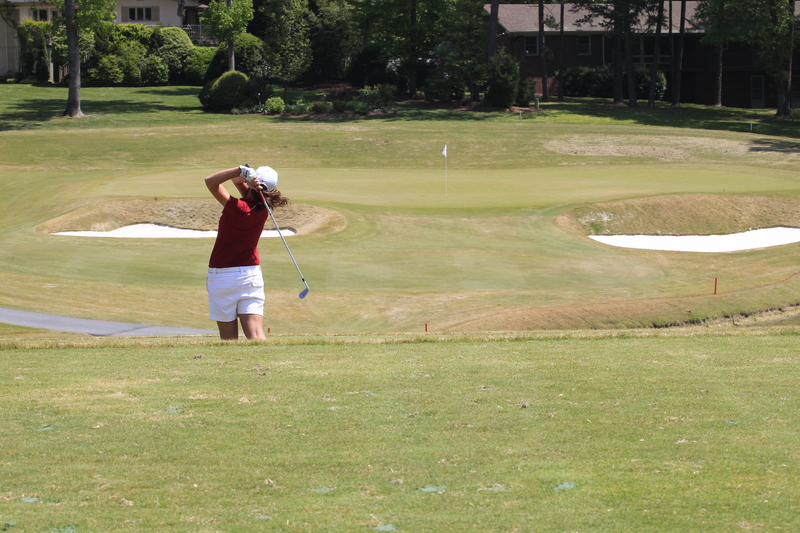 I was beside myself with excitement about this opportunity to play with LPGA professionals and see what the tournament set-up would look like. 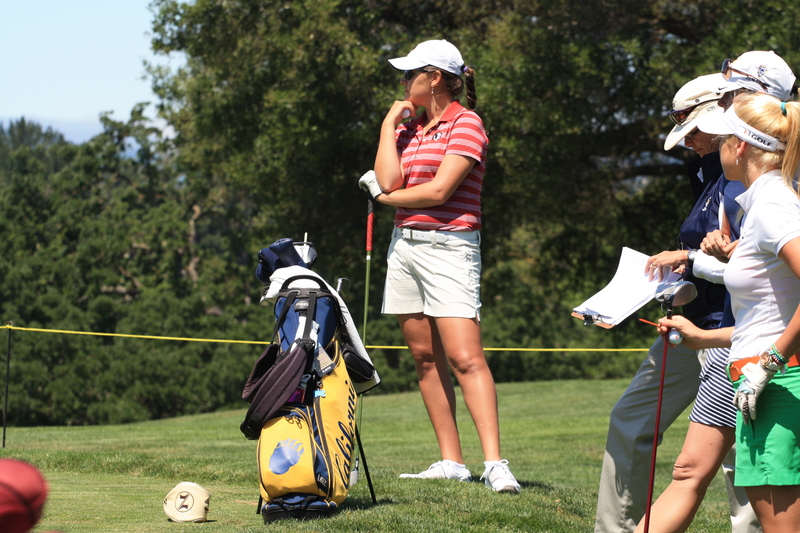 When I arrived to practice at the course two days before the qualifier, I was in awe. The ropes were up, the grandstands were set, and there were merchandise and concession tents everywhere. This was it. This is what playing professional golf is. I tried to soak it all in and still maintain my composure and focus. 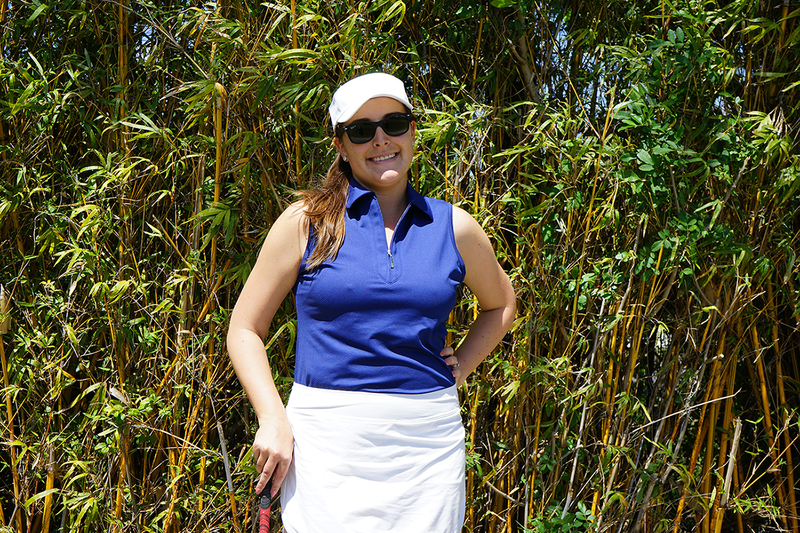 When I stood on the first tee, I felt out of my element. 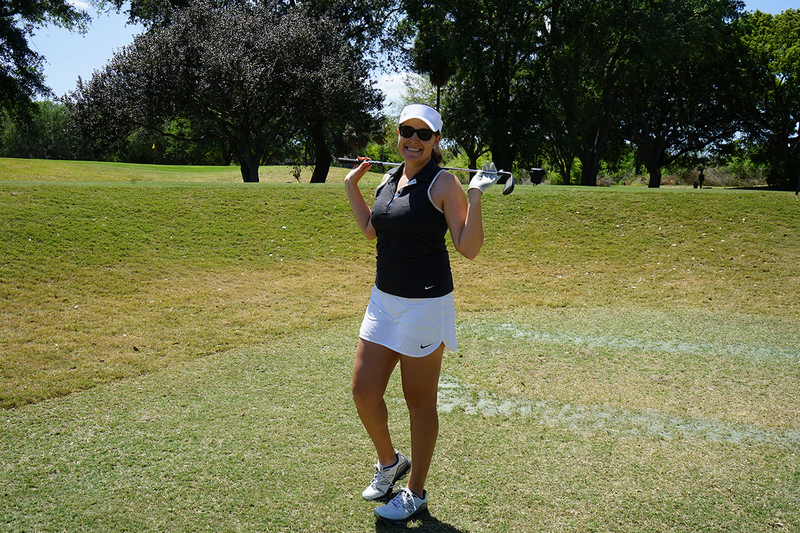 The women I was playing with were seasoned professionals, they had professional caddies and my rhythm felt off. 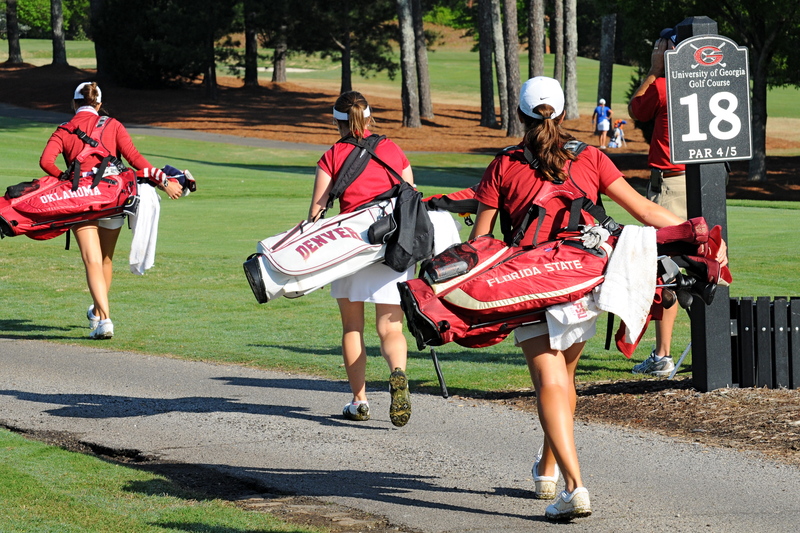 The officials expected your caddy to ask about lift-clean-and-place and procure a pin sheet. My first few holes showed my nerves. I hit my shots and my putts tentatively, leaving my ball short in the blustery conditions. Finally, I realized that it was still just golf, even if it was an elevated setting. I relaxed and swung aggressively and suddenly I was out-driving my competitors. I began to have looks at birdie and played my last 13 holes at one over par. 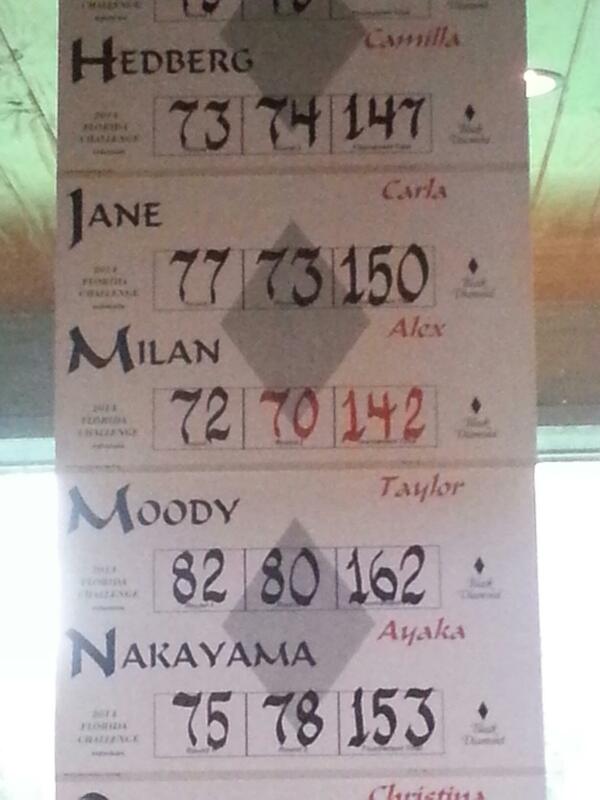 A 77 in tough conditions left me T33 out of 84 women. 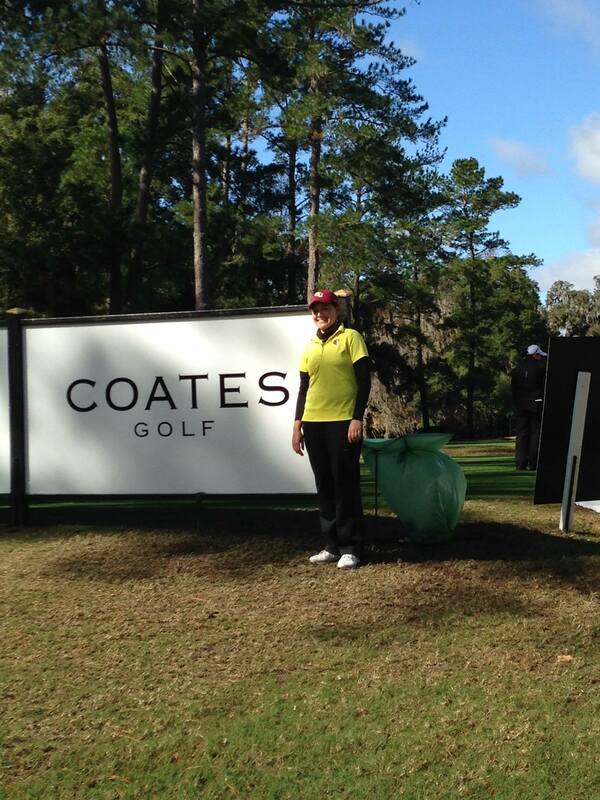 The best part of this experience for me was being able to see that I have the game to play on the LPGA. 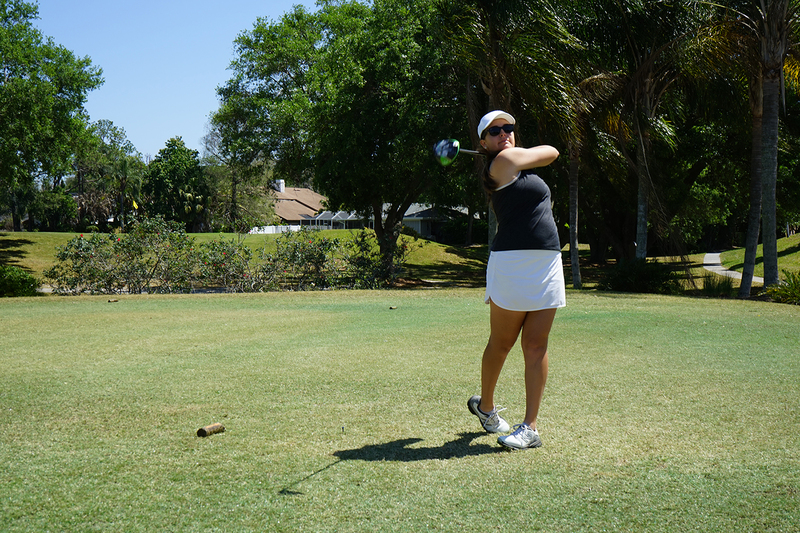 I competed against women who have LPGA tour cards and showed that I belong out there! 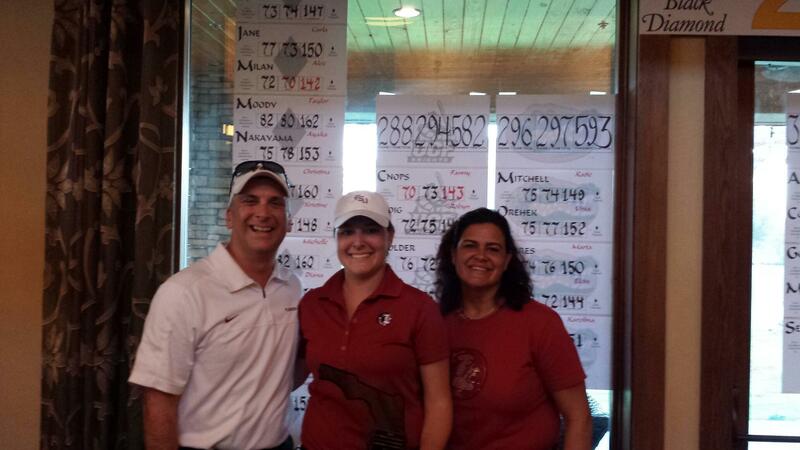 I am now more motivated than ever to fight every day to get better in anticipation of Q School in the fall. Now I can objectively say that I have the game to compete on tour. Warming up before the event. 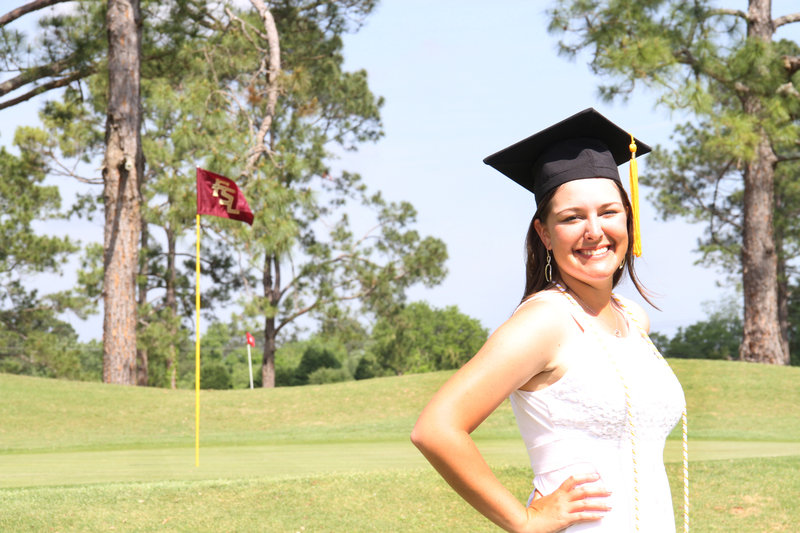 After four amazing years of collegiate golf at Florida State, I have graduated with a degree in Finance and now I get to start the next chapter in my life. This week, I have a big announcement for all of you. 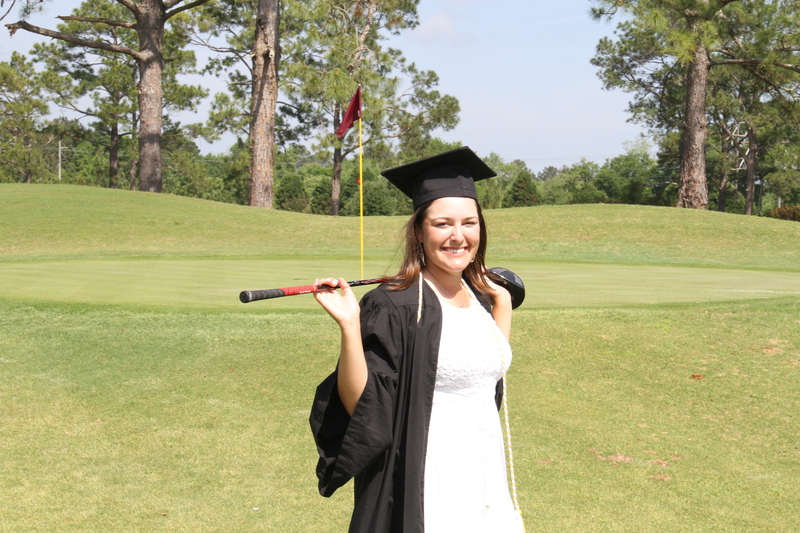 I will be declaring my status change to a professional golfer! 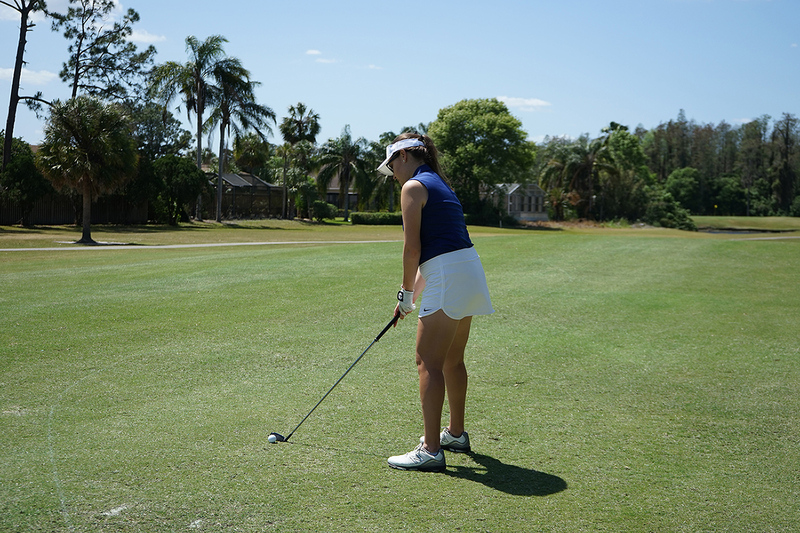 When I was in fourth grade, I began to tell anyone who would listen that I was going to be a professional athlete and that one day I would be competing with the women on the LPGA. It is interesting to note the way my dream has been received as I have gotten older, and closer to my goals. When I first began to dream, my teachers smiled at me and encouraged me; family told me how hard I would have to work and that I could do it. However, at some point in high school, people began to tell me that golf was not a career plan. I needed to study and to have plans outside of sports. So I appeased them. I became valedictorian of my high school, and I dreamt up some ideas of corporate jobs. In college, after battling through an injury, I was invigorated. Golf truly was almost taken from me and that made me want it all the more. I did realize, however, that my body was not invincible, so I took an internship to prepare me for the corporate world just in case. I never lost sight of my real dream or the desire to pursue it. I have endured the laughs and smirks from my peers and professors, from advisors and administrators, and even doubt from some of my family. Through it all, I knew this was my plan, this was my dream. I will be making my professional debut on two mini-tour events that are a warm-up series for Q School in Palm Springs, California. 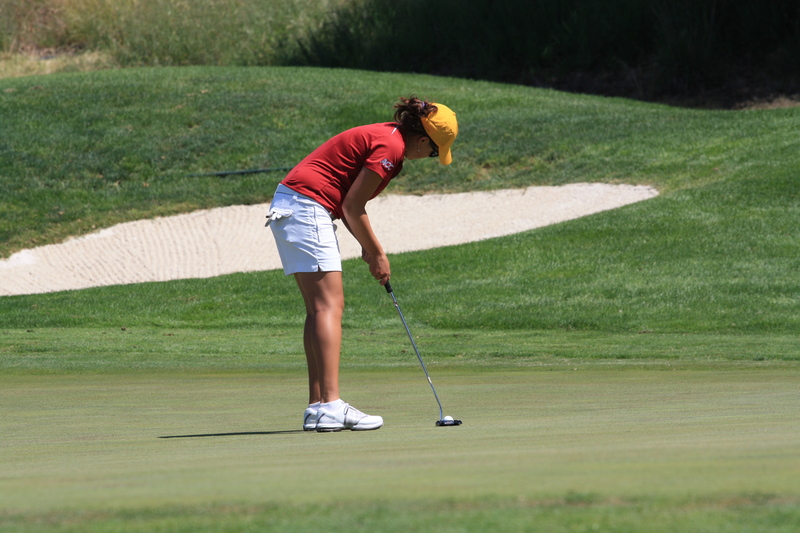 Stage One of Q School is a four round event the first week of August in Rancho Mirage, California. To be here in this moment is indescribable. I have trained, practiced and sacrificed since the moment that small, fourth grade version of myself decided that this was my dream. Now, I have the incredible opportunity to breathe it in and live it. I still have a lot of work to do and many small goals to accomplish in order to join ranks with the women on T.V. every week, but as of this week I can say that I am a professional athlete. And somewhere inside me, that fourth grader is celebrating. I think that Q-School is a lot like the Hunger Games, 288 girls enter and only 60 come out. Unfortunately, I was not one of the 60 this year. I did not shoot the scores that I needed to advance. While this has been heart-breaking that things have not gone according to plan, I learned a lot. I learned that I have the game to be out there, but I have some work to do on controlling my thought processes under stress. Due to some crazy circumstances, I played without a caddy this week. While the situation was less than ideal, I think it will be for the best. I am going to play mini-tour events this year, the prize money has been significantly increased, which makes this a more feasible option. I think that playing more professional events where cuts are on the line will have me better prepared for next year. After all the experience I will gain, when I do get status, I will be unstoppable. 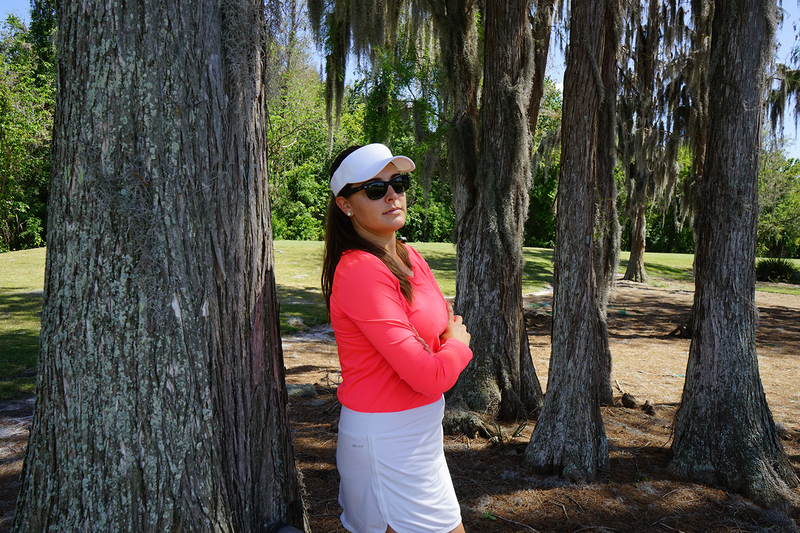 My next step is to plan out a desired schedule of professional events and Monday Qualifiers for the LPGA and hopefully find some sponsorship or private backing. I will be getting a part-time job to help cover some of the costs. This route is different than I had imagined, but with some flexibility I can still make my dreams a reality. My plan was not the same as God’s plan for me this week. But I know that I am right where I am supposed to be and I will get exactly where I need to go.